After an interesting morning featuring a music battle between the Japanese Communist Party and the Uyoku, the Penpal and her parents took me to lunch at Uobun, the 100 year old tempura restaurant in Numazu. I had been to the restaurant once before, when my family had come to visit me last summer. Just like last year, the food was fantastic. When we finished our lunch, we went for a drive to the town formerly known as Nirayama in Izu Peninsula. Like small towns in Canada, the small towns in Izu are amalgamating to form large, sprawling towns with one city government. Last month, Nirayama officially joined Izunagaoka and Ohito to become the new Izunokuni City. The area of Izunokuni was important historically. 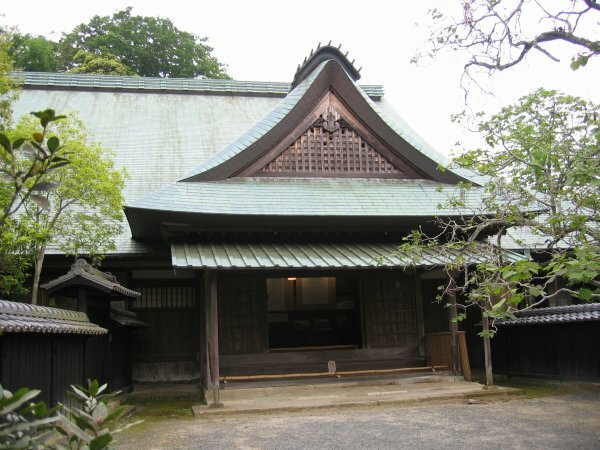 It was the site of a Tojo clan castle in the Kamakura and Muromachi periods, and home to a daikansho (magistrate office) during the Edo period. We went to a historical site called Egawa-tei, the home and headquarters of the daikan Hidetatsu Egawa. During the period, the daikan was roughly the equivalent of a police officer, governor, and tax collector for a region on behalf of the imperial government. We took a guided tour, but since Egawa-tei is not a common tourist spot for foreigners, the tour guide only spoke Japanese. I took a Japanese history class in University, so I had a reasonably good idea of what the guide was talking about, and The Penpal translated the parts I couldn’t understand. Having a personal translator is great for me, and really good English practice for her. In addition to being an important government official, Egawa was also known for communicating with Dutch Traders during the Edo period. For about 200 years, Japan closed its borders to outsiders except for the Dutch. Egawa’s main imports were techniques for making bread and cannons. Bread was a game changer for armies, as it provided a stable and portable staple food as opposed to rice. Dutch cannon technology was used to build coastal defenses to help keep Japan safe from the non-Dutch. Thanks to my interest in Japanese history, this turned out to be a very interesting place to visit. It’s also a place I never would have found without The Penpal and her parents. If you really want to experience Japan, I strongly recommend making connections with Japanese people. It will give you an entirely different experience. We woke up in Ryokan Ooya to a massive breakfast. I think if I spent a week here, I would gain a lot of weight. We watched the news in the morning and heard that a huge typhoon was heading in our direction. Fortunately the weather held out for the day. 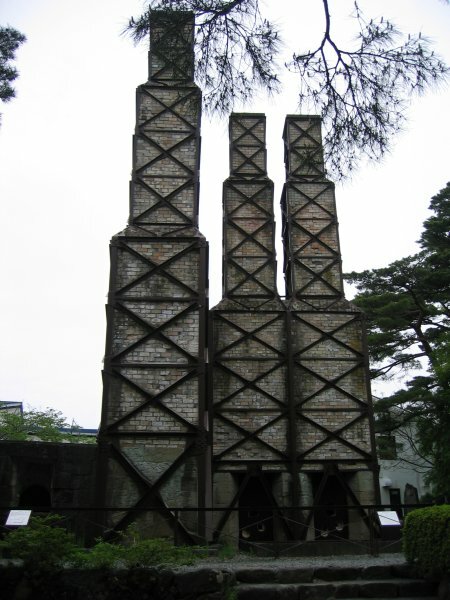 We checked out of the ryokan and went to an old gold mine which has turned into a museum. The mine is over 400 years old. Visitors can walk through and see the working conditions, complete with signs and models of workers in period clothing. The work looked hot and dangerous. I don’t think I would have liked working there. After the gold mine, we went to Koibito Misaki (lover’s cape), a beautiful sightseeing spot on the west cost of Izu peninsula. The view was spectacular. To the we could look across Suruga Bay towards Shizuoka city. To the east were the green, tree covered mountains of Izu. 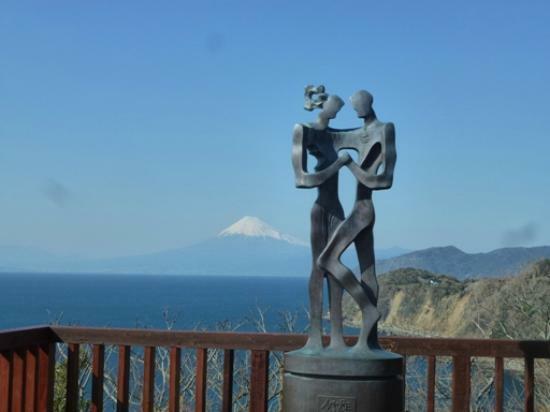 Koibito Misaki is a popular tourist spot for Japanese people, but foreigners rarely visit. I think I was the only gaijin in the area today. One of the highlights is the large “Love Call Bell”, which is a large metal bell with a rope attached. If a young couple rings the bell, their love will last a long time. We rang the bell, and time will tell if it worked. 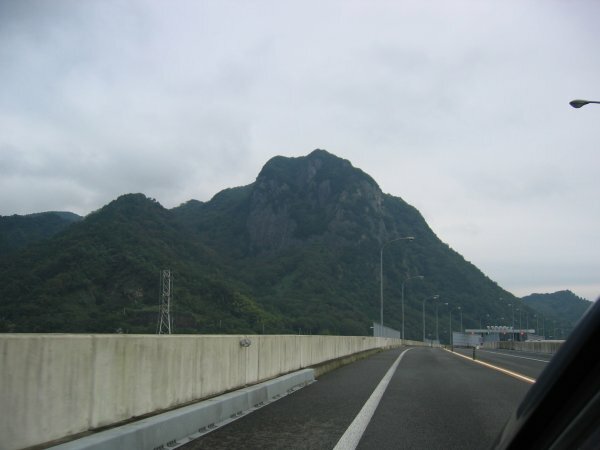 On the way back to Numazu, we took the most windy, dangerous, crazy road that I have ever seen. At times the road ware barely wide enough for two cars. Other times the road suddenly went into endless S-curves up and down the side of a mountain. It was both fun and scary at the same time. I would recommend this road on a motorcycle, but never on a car. Our weekend together was a lot of fun, and it was a great break from work. Japan is full of natural beauty, but you have to get away from the big cities to find it. (2014 Update) Apparently there is a waterfall in Fujinomiya that has the opposite effect of the Love Call Bell. We didn’t go there. The Penpal and I left Mishima and headed south towards Izu Peninsula. Toi is on the west side of Izu Peninsula. The peninsula is full of tree covered mountains with small towns along the coast and in some of the flatter areas in the middle. The Penpal has a friend who lives in Toi, and wanted me to meet her. The friend was excited to introduce me to her young son. I would be the first foreigner that he ever met. The concept of “wow my son is going to meet his first foreigner today” may seem a bit strange to people outside of Japan, but I have been hear almost a year so it doesn’t seem unusual anymore. We had a nice visit at their house, and then moved on to our next destination, Ryokan Ooya. A ryokan is a traditional Japanese inn. The rooms have tatami mat floors and sliding wooden panels. Everyone wears yukatas, and they serve traditional Japanese food. When we checked in, I learned that I was the first foreigner to ever stay at Ooya. The Penpal knew the owner’s family, so we got upgraded to a huge room. Our dinner was served in the room by yukata clad ladies. They started bring tray after tray of delicious looking seafood, soups, and things I had never seen before, all laid out on fancy decorative plates. It was simply the most beautiful food I had ever seen. There was probably enough food for four people, but the meal was all for us. We did our best but couldn’t finish everything. After dinner, we had a reservation for one of the private outdoor baths. Reservations could be made in 30 minute blocks. 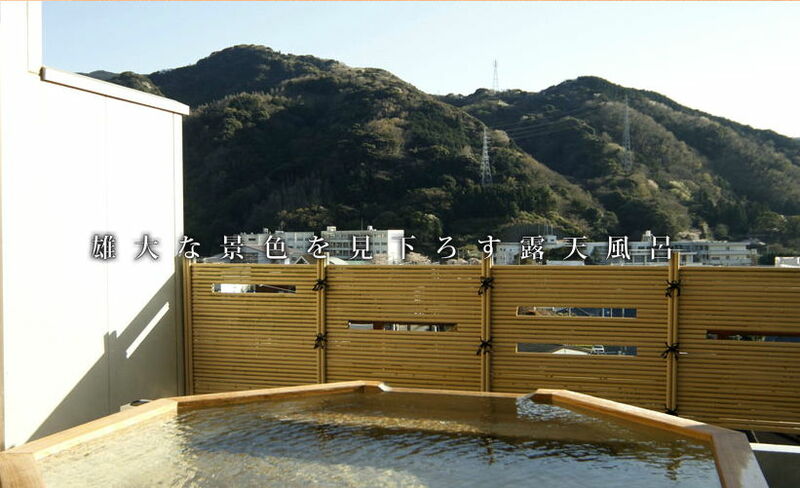 Like most Japanese baths, we had to clean ourselves first, and then sat in neck deep hot water. Between the relaxing water and the amazing view, our 30 minutes went by very quickly. Thanks to the food and hot outdoor bath, it was an early night. If you ever get the chance, stay in a Ryokan. Don’t think of it as a hotel, think of it as a destination in itself. And arrive hungry. Today I went to Izu with The Penpal. Izu is a mountainous peninsula that runs south from Numazu into the ocean. There are small towns through the central areas and along the eastern coast. 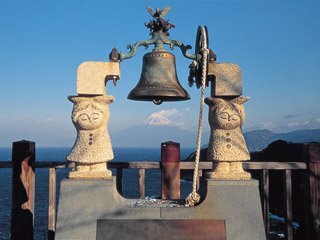 Izu is a famous area for hot springs, Ryokans (traditional Japanese Inns), and vacation spots that cater mostly to Japanese people. Due to some terrible weather, most of the plans that The Penpal made fell through, but I still enjoyed riding around and seeing the sights. Riding in a tiny car on winding mountain roads after a big rain storm is quite the adventure, especially when you still haven’t adjusted to driving on the left side of the road. Other than the scenery, one of my personal highlights was eating grilled eel on rice served with pickles and miso soup. Eel is seriously delicious.